Taking advantage of credit card opportunities for valuable points can be very rewarding in travel terms. Collecting 100,000 or 200,000 points through programs like American Express Membership Rewards or Chase Ultimate Rewards can supply fuel for extravagant business class and hotel suite journeys. The points rewards game can be complicated and tiresome, though, particularly as airlines reduce availability of mileage award seats as profits and sales increase. In lieu or in addition to points or miles rewards, some cards provide easy to use companion tickets or other free tickets that are much simpler to redeem and can be used on just about any flight. Some airlines actually offer a free seat, not just points or miles, with their co-branded credit cards. Image by Alaska Airlines. These cards provide a free or companion ticket benefit, in addition to perks like free bags, priority boarding, onboard discounts and bonus miles. The Alaska Airlines Visa Signature card comes with a companion fare. Alaska Airline’s card product often comes with a trove of valuable Alaska miles. It also comes with the “Famous Companion Fare”. That’s a free buy-one-get-one ticket, in economy or first class, on any round-trip Alaska itinerary (typically a minimum fare, around $121 or so, is required). Alaska’s $75-per-year card comes with the companion pass plus bonus miles (they vary). The pass is easy to use, effectively functioning as a travel certificate that can be applied to any round-trip fare. The second passenger may pay some taxes and fees. Delta’s Platinum and Business Platinum, Reserve and Business Reserve SkyMiles Credit Cards, from American Express and American Express OPEN, all come with Companion Certificates. Unlike the Alaska Airlines Signature Visa, the Companion Certificate doesn’t come right away, but on each card year anniversary. That means you have to wait until you’ve renewed the card before you start earning the benefit. A first year $100 statement credit can help offset the $195 annual fee on the Platinum cards and the $450 annual fee on the Reserve cards. The Reserve SkyMiles card also include Delta Sky Club access. These cards also offer revolving introductory bonuses ranging from 30,000 up to 70,000 miles for new cardholders, after spending a certain amount in the first months. Southwest Rapid Rewards cards contribute toward Companion Pass earning. Southwest operates a price-based reward system. That means that the introductory bonus on the fleet of different Southwest Rapid Rewards Credit Cards — Plus, Premier and Priority — can be applied directly to airfare on any Southwest flight. Perhaps the most valuable travel hack out there, Southwest Airlines’ companion pass, is good for not just a single free ticket, but an unlimited number of free tickets. The famous Companion Pass allows its benefactors to bring a second passenger on any Southwest flight for free for over a year. The companion pass kicks in at 110,000 Rapid Rewards points, which can be accumulated through flights, credit card spend or even the Southwest online shopping portal. Even better, the introductory bonus for new cardholders counts toward Companion Pass status. Share your ticket with a companion. Southwest Airlines’ Companion Pass allows holders to bring someone with them for just taxes, for over an entire year. Rapid Rewards introductory bonuses most commonly hover around 40,000 points, after new cardholders spend $1,000 in three months, or 60,000 points after new cardholders spend $3,000 in three months. The new Southwest Rapid Rewards Priority Card offers up to 65,000 points after new cardholders spend $25,000 in the first year. Of those, 40,000 are earned after spending $1,000 in three months. This card also includes priority A-group boarding on four flights annually. British Airways’ credit card holders can earn a Travel Together ticket after spending $30,000 in a year. 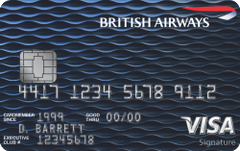 The British Airways Visa signature card, in addition to offering handsome introductory bonuses from time to time (we’ve seen up to 100,000, though spending requirements can be high), offer cardholders who spend $30,000 or more something called a Travel Together ticket. I saved this card for last because it is somewhat more complicated to use than the aforementioned free tickets, but still potentially powerful. The Travel Together ticket is a companion ticket not for cash fares, but for an award fare. Book an award ticket using your Avios earned through the card and travel, get a second award ticket for just the taxes and fees. Unfortunately, the Travel Together ticket can only be used on round-trip awards originating in the U.S., and can only be used on British Airways flights. That means paying fuel surcharges that may be upwards of $600. Still, the card offers those who spend $30,000 or more in a year a free ticket and valuable way to quickly double down on an award redemption. Correction: This story has been updated. Alaska’s Famous Companion Fare is valid for economy class seats only. Sorry but the BA companion ticket is nearly useless due to YQ fees. I’m not much of a Delta person but that card might be the sleeper in the group with “OPEN” benefits and lounge access. I wouldn’t say the BA ticket is useless, but it is definitely convoluted. Annual Companion Fare Benefit: Primary cardholders whose accounts are open and in good standing on their annual Account Anniversary date will receive a Companion Fare code within the first 2 billing cycles after the Anniversary date each year, which will be credited to their Alaska Airlines Mileage Plan™ account. The code is valid for a round-trip or one-way coach Companion Fare on Alaska Airlines from $121 (USD) ($99 base fare plus taxes and fees, from $22 depending on your Alaska Airlines flight itinerary) when traveling with another passenger on a paid published coach airfare on the same itinerary, booked at the same time on alaskaair.com. Multiple stopovers not allowed. The Companion Fare code must be redeemed at alaskaair.com within 12 months of the date of issue. Once ticketed, travel may be completed after the expiration date of the Companion Fare code. The expiration date cannot be extended and, once your Companion Fare code has expired, it cannot be exchanged. If your Account is closed, you are no longer eligible to receive this benefit. Mileage cannot be used as a form of payment, however mileage credit accrual is allowed for both passengers. The Companion Fare code is not valid with award travel, and cannot be combined with any other airfare discounts. Passenger is responsible for all applicable taxes, fees, surcharges and applicable checked baggage fees. Applicable taxes and fees are subject to change. Gordon, you are correct. Thanks for catching that! Correction made.